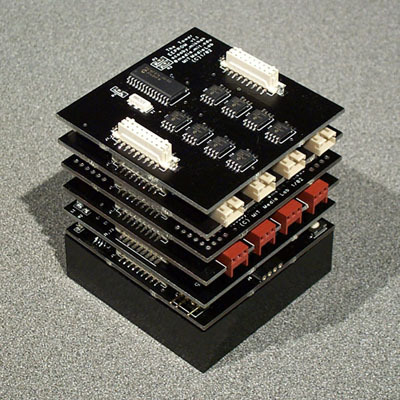 The Tower is a powerful, flexible and extensible, yet inexpensive modular development system for designing and prototyping computational devices. Physically, the Tower consists of a primary Foundation layer with a central processor. Additional circuit board layers can then be stacked on top for added functionality, as a particular application requires. We have been working to create a base set of layers that perform many standard functions and will be useful for a wide variety of electronic systems. Existing modules for sensing, actuation, data storage, and infrared communication will soon be joined by ones for enhanced display output and high-speed wireless communication. The presence of these existing modules allows users to develop prototypes of electronic systems rapidly and efficiently. But the beauty of this system lies not in the functionality that it already has, but in the functionality that it is capable of attaining. We are creating a suite of design and development tools that will enable anyone to extend the system as their needs and desires dictate. With full support for industry standard protocols, the task of getting a new layer up and running can in many cases be reduced to a single afternoon. This web site contains information about the Tower system and its components, some applications of the system, and information about how to get Towers and obtain support.